The pump units of ModvFresh provide the instantaneous production of hot domestic water, avoiding phenomena of bacterial pollution, such as the legionnaire’s disease etc. made by the stagnation of the hot water. The water coming from the water supply line is immediately heated thanks to a plate heat exchanger, and the requested supply temperature is mechanically or electronically controlled according to the model used. 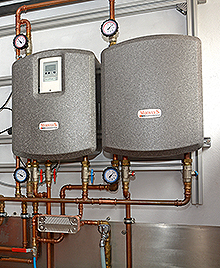 ModvFresh pump units are suitable to be installed on inertial storage tanks (buffers) connected to heating installations both traditional and with thermal solar energy, wood boilers, pellet, biomass etc. Thermostatic control. The model ModvFresh 1 has a thermostatic control of the temperature of the supplied hot domestic water, in a very easy and prompt way, by turning the handle of the thermostatic valve. This model assure very low headlosses and it does not need any additional electric wiring in addition to the power supply. 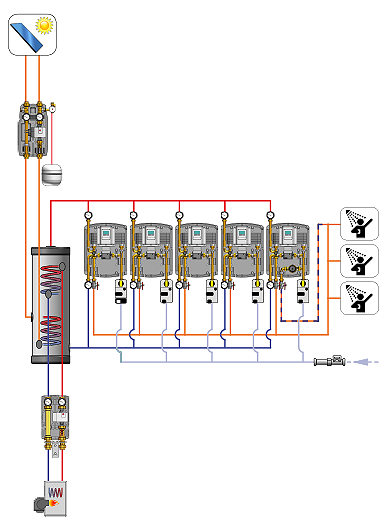 It is also possible to make “on parallel” installations up to five pump units to get high power and flow in a easy way without any electronic controller or motorized valves. Electronic control. 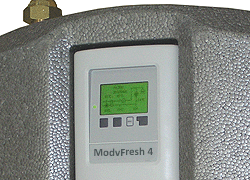 The models ModvFresh 2 and ModvFresh 4, thanks to an electronic controller and to a VFS sensor, gives more specific functions and it optimize the return temperature to the buffer tank, keeping it the lower possible, so improving the performance of the installation. Models with recycling line are also available, to assure a soon ready supply temperature to the user; in these models the controller makes a disinfection of the recycling line at scheduled intervals. 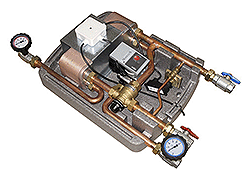 Modvfresh pump units are fully preassembled and prewired, they also are insulated from the thermal point of view by means of an EPP box that is standing out for its modern and nice design. with connection isolating valves set. detail of the electronic controller. Unmixed pump unit M2 DN32; Δt 20 K.
employment of a solar thermal pump unit S2 Solar 20 High Flow. - 1 pump unit with recycling with ModvSlave servomotor. Attention: the representations are to be considered just as an indication and they have no completeness pretension.